Huh Jung's first foray into directing has turned out to be a box office smash ,made on a budget this tight thriller will grab you and get hold while at the same time scaring the wits out of you as you jump about in your seat trying to figure out the puzzle. For a full review and pictures from the special Preview Gala of the film held on the 6th of November 2013 click here ! From Block Busters to low budget art house the Festival has films to appeal to everyone. 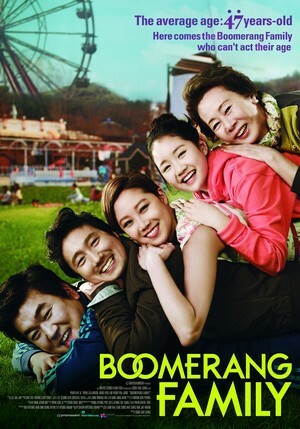 From the Opening film Hide and SEEK to the closing film Boomerang family the variety on offer is quite astounding. One of the highlights was the Directrospective of films by Kang Woo Suk a film maker who has delivered great films time and time again . From early classics like Two Cops and Public Enemy which where free to view at the festival as a bonus to more recent films from his repertoire like MOSS and his latest Fists of Legend. In all six films where on the cards from the director ,but in fact only five where shown as their free screening of Public Enemy Returns was actually Public Enemy (someone mixed up the films there) any way Public Enemy was again screened at the Curzon Cinema with the Director and actor Sol Kyung -Gu on stage for a Q+A. 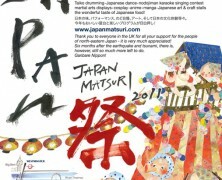 We where going to go to this ,but as we where at the first screening of the film we chose not to. But we did get to the screening of Fists of Legend where Kang Woo Suk and Actor Yoon Je-Moon where on stage for a Q+A ,which was very entertaining. The other film from the director was Silmido , a film he made in 2003, we did not go to this screening as we had the film and viewed it at home for a review to follow. Silmido from Kang Woo Suk , 2003 film shows how some are forgotten. Other films on show where more about showing the actors at work doing what they do best , in films like HOPE by Lee Joon-Ik which starred actor Sol Kyung-Gu ( Public Enemy) as a father who along with his wife have to go through a family ordeal after a attack on their daughter. Again this screening was finished of with a Q+A with actor Sol Kyung-Gu. Behind the camera a documentary come farce starring Youn Yuh-Jung and directed by E J Yong was a another free screening held with both director and actress on stage . There was a also a series of shorts from Director Kim Jee -Woon ( The Good The Bad The Weird , The Last Stand) held on the first Saturday ,again with the director for a Q+A , we where invited to this as we where at a screening of Public Enemy ,but really did not know what to do for two and half hours till the event ,so we missed that one. Add to this a series of box office hits from Korea ,with the recent ''FLU '' which is still to be released on DVD /Bluray in Korea, from director Kim Sung-soo. Of course you can guess what it's about ,yes it's about a severe strain of the virus which gives the infected just 36 hours to live . Review soon on one of our sites . Miracle in Cell No'7 - 2013 - by Lee Hwan-Kyung is a film about a Mentally challenged adult who gets wrongly imprisoned and ends up in the slammer with some of the hardest criminals known to man, it's a comedy drama and one where be looking into soon. Secretly Greatly - 2013 - by Jang Cheo-soo is a action film about North Korean sleeper agents, we did want to get to this but just could not. But as the film is available on import DVD 'look out for a review hopefully before Christmas. Montage -2013 - from Jeong Keun-seob is a thriller about a kidnapping of a young girl which happened fifteen years prior . There was so much to see ,but it's nigh impossible to view every film at the festival even if you had the time , with quite a few clashing with others ,we wanted to desperately see Kang Woo Suk's ''MOSS'' and ''Fatal '' by Lee Don-ku a revenge and guilt drama which released this year. Even their animation day held a film we wanted to see, ''Bolts and Blip'' ,but we got out of the Public Enemy screening when the film was due to start ,and their was no way we could get to Covent Garden Odeon in time. Last year we attended three films and vowed to see more this year ,and we did with five films in total. But with better scheduling we could have seen double that. We go for the marathon film screenings if we can ,the Terracotta Far East Film Festival being our favourite for convenience. If four or five films showed in the same cinema in one day that would appeal to us better. As where not unaccustomed to sitting through four or five films with just a half hour break ,also it saves a fortune on travel fares. You could still have your opening and closing gala,but bring the brunt of films together under one roof ,now we would enjoy that. For us the festival was great this year ,we got to see the opening and closing films and some in-between, And all of the screenings we attended bar one was with one guest or more on stage which added to the experience. Hopefully we will catch up with some of the films we missed in the near future ,but for now look out for our reviews of the films we attended which give a insight to our time at the festival as well with pictures of the stars and directors. Other films included in the festival are as below. The there was a series of shorts as well in the Mise en Scene selection which screened over two days as well. We look forward to the festival each year and can't wait to see what Korean Cinema throws at us in the following twelve months. But with so much great cinema coming from the region ,one thing is for sure ,we won't be short of engaging and gripping films to view from what is fast becoming the best in the business for Asian cinema with a edge. 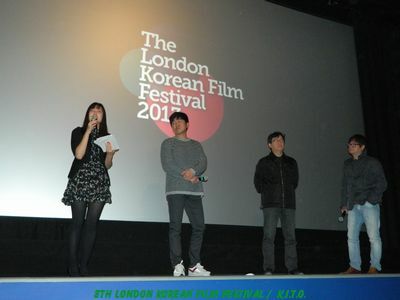 For London the final day was 15th November ,the closing gala film was a light heart comedy from director Song Hae-Sung. 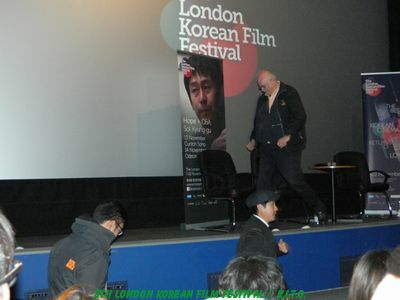 More then 800 people packed the Odeon West End in Leicester Square with the Ambassador of South Korea ,The films Director and two of it's stars as well as the producer and the directors of the Korean Cultural Center in attendance . left to right - Interpreter Sah,Actor Yoon Je-moon,Actress Yoon Yeo-joong , Director Song Hae Sung hiding behind Film Critic Tony Rayns. Outside the Korean Cultural Center in London's Strand, where some screenings where held.